One of the most legendary, influential and enduring names in the history of rock music, Sweet, release a brand new studio album - their first since "Sweetlife" (2002) - on April 27th. The first single is "New York Groove" of Ace Frehley fame. Watch a live perfomance below (lower video). With worldwide album sales of more than 55 million copies, Sweet have notched 34 #1 smashes across the globe as part of a run of timeless hits that includes "Blockbuster! ", "Hell Raiser", "The Ballroom Blitz", "Action" and "Fox On The Run". Seen on Top Of The Pops on what felt like a weekly basis throughout the 1970s, their über-harmonious, multi-tracked guitar work and layered production was to provide inspiration to other acts such as Queen, Def Leppard and Mötley Crüe. Now comes "New York Connection". Recorded by original member Andy Scott (guitar and vocals) and his current line-up of Pete Lincoln (lead vocals and bass guitar), Tony O’Hora (guitar, keyboards and vocals) and Bruce Bisland (drums and vocals), the new album is a selection of material originally penned by other artists awarded the band’s instantly recognizable thumb-print. So it’s a boring covers album, then? Well, no. Not really. This time there’s a bit of a twist. 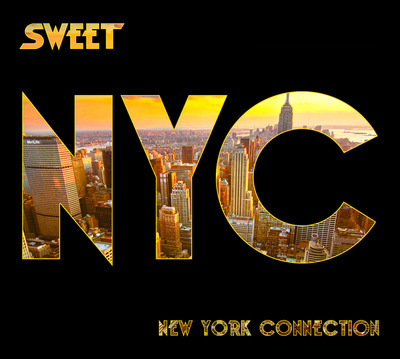 "New York Connection" is available via TheSweet.com, iTunes and Amazon. Read the full story on Bravewords. simple as, great songs given the sweet treatment a fully recommended purchase,definetly one for the collection. It is simply just a great album. Would say they did it again even if it is not their own songs, just like the remastering of New York Connection. Great Job Andy. My housemate just got this and I had to look up what it was, because it is one of the best albums I've heard in ages. Simply great stuff. Agreed! Surprisingly good track selection (track choices not too obvious so covers are actually endearing instead), and delivery really very true to the old Sweet STYLE. Excellent renditions of Dead or Alive, Black Keys, Patti Smith, Ramones as well as the more obvious Who and Ace Frehley versions that have been on the web for a while. Not quite 'Give Us A Wink'or 'Sweet Fanny Adams' but very creditable anyway, and a great shame Sweet probably won't get the airplay they should! This really is better than a lot of charting 'originals' at the mo! Truly!! Will be a couple of small U.K concerts this summer so check them out. 8/10!